The Popeil Pasta Maker is a quick and efficient way to make fresh pasta at home. Using the simple ingredients of flour, oil water and eggs you can make a wide variety of pastas for whatever meal you would like in minutes. Add vegetable juice to the mix to make the pasta even healthier. The machine is easy to use and easy to clean and saves you time and money in the kitchen. Verify the machine is turned "Off." Make sure the mixing bin is firmly attached to the base or the machine will not work. Measure 2 cups of flour and add any desired seasonings. Make sure to tap the cup to remove any air pockets and use the back of a knife to level the flour off. Open the mixing bin lid, dump in the flour, then close the lid tightly. Select the desired pasta die (10 are included) and place in hot water for 1 minute to warm it up. This will make the extruding pasta come out more easily. Remove from heat and place the die on the front of the pasta maker and secure it with the locking ring. Use the measuring cup included with the pasta maker. Pour 2 tbsp olive oil to the line that reads "Oil." Add 1 egg (optional) and with a fork, lightly combine. Add water (or vegetable juice) to the line that reads, "Oil + Egg + Liquid." If you are not using an egg, add the liquid to the line that reads, "Oil + Liquid." Push the switch on the side of the machine to the "Mix" position. Slowly add the liquid through the liquid crease on the top of the bin. Allow the machine to mix for four minutes. The dough should look like small pea-sized lumps. Turn the switch to the "off" position and wait until the machine comes completely to a stop. Push the switch down to the "Ext" position and the dough will begin to extrude through the die. When the dough reaches the desired length, use a butter knife to the cut the pasta. On some models of the machine a built-in pasta cutter is included. Place the fresh pasta in boiling water and cook until firm to the bite, or "al dente." 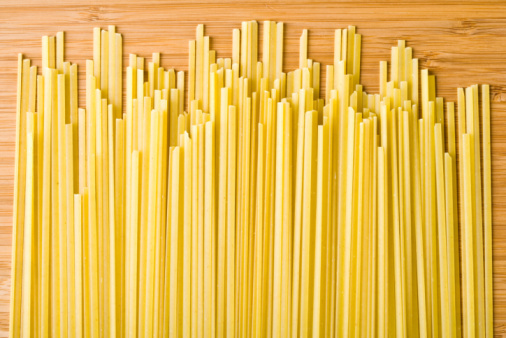 Smaller pasta like angel hair will cook in less time than thicker pastas like rigatoni. Based in New York, Noah Sharp has been writing about film and pop-culture since 2002. His articles have appeared in "Reelin'" magazine, as well as the website Everything's Fantastic. Sharp received a Bachelor of Science in film from Ithaca College, with minors in writing and art history.